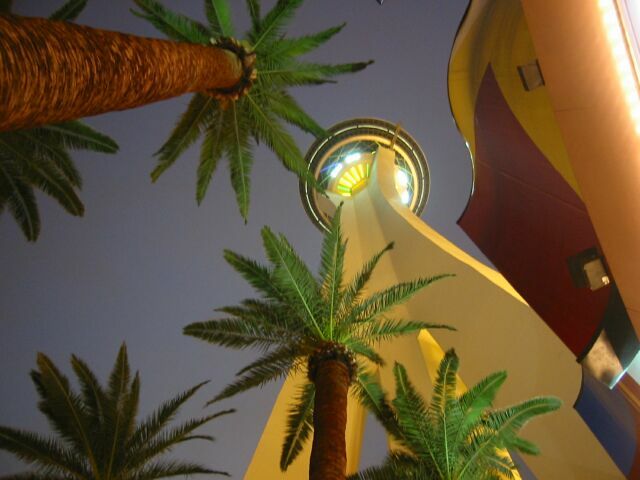 Unique view of the Stratosphere Tower, Las Vegas -- tallest structure west of the Mississippi. Isn't she lov v v v ely. . .? 1/18/05 If you attended Bruce's bachelor party and would like to see the top-secret photos from Mykonos, the Greek restaurant, then you have to become a member of the He-Man Woman Haters' Club. For security reasons, I'm not saying how someone would actually view these photos online, but I can say this: in order to be a member of the club, you have to have the HMWHC pin. That's the pin right up there. The one with Alfalfa on it. P.S. We don't really hate women. It's just kind of a joke. 12/29/03 I added photos and videos of our trip to Tucson and Vegas to the table below. 11/06/03 I've added photos of my sister Susan and from my father's and my trip to North Carolina to see family and attend his high school reunion. Also, photos from the 2003 Halloween season and other Amigas pictures. If anyone wants a copy of any of these pictures, don't just copy them from the site. Let me know, and I'll e-mail you the original, which will be much better quality. Click on the first shot in the series to begin. My awesome camera is one of my closest friends. When we're not hanging out taking snapshots of nature and friends, we're working on the myriad ways of converting our little 30-second videos for web viewing (the videos are a work in progress).